The East Coast Pedalers Section is no longer active as Carl has stepped down from running it. If anybody on the East Coast would like to reactivate this NACC section, please contact Secretary Liz Butler or Chairman Ray Butcher. Contact information in on page 2 of your latest Buzzing magazine. 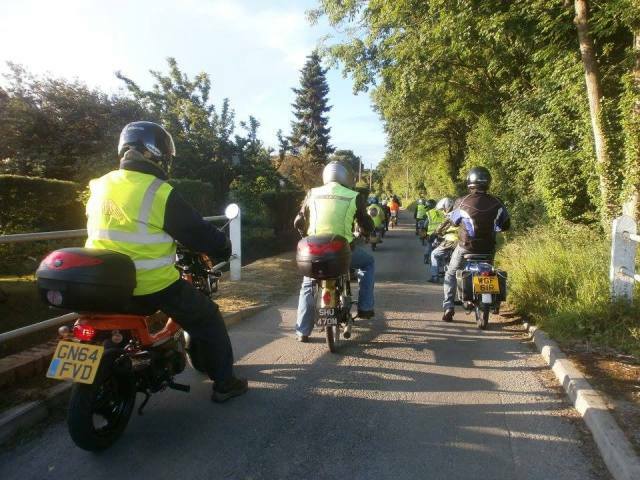 Despite an uncertain weather forecast 13 Riders and one pillion gathered at the Horham Community Centre for the second staging of our annual 50+ mile run. However only 12 machines set off as wisely David thought it would be foolhardy to attempt the 68 mile route on his Berini cyclemotor. He said that he would “do his own thing” which we suspected would involve riding the machine down the road where he would park the machine up in his garage, make a cup of tea and laugh as we got caught out in the rain which was forecast later in the day ! The line of machines settled in a nicely spaced formation behind the route deviser Carl Squirrell whose Honda PC50’s comfortable speed of 20 – 25mph would set the pace for the day. We did encounter some light rain after a few miles but this soon passed and was all we were going to get for the rest of the day. We soon reached the A143 crossing at Billingford where we joined an unclassified road up to the A140 junction, soon we had crossed the border into Norfolk and were well on our way to the halfway stop and the Reedham Ferry crossing. Unfortunately, just before we reached the A146 crossing, Harold’s Camino ran out of fuel due to a split fuel pipe, this was soon fixed but the machine would not keep going with the meagre reserve supply he was carrying in his top box. After some discussion it was decided that because of the non-standard Puch carburettor he had fitted there was not enough of a head of fuel to keep the float bowl filled, so Michael donated his 3 litres of spare fuel and everything returned to normal. 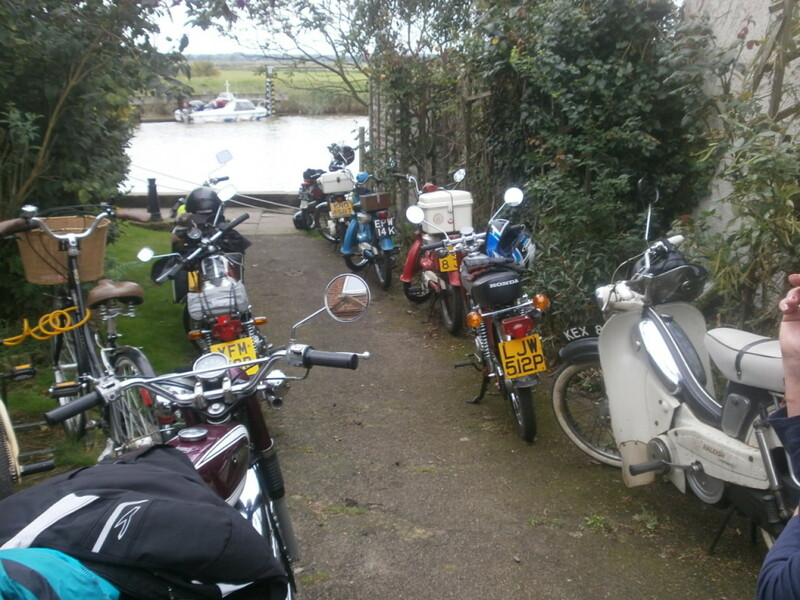 It was then a short run to board the Ferry at Reedham where we crossed the river Yare and made our way to the Ship Inn lunch-stop. A fine meal was enjoyed by all at this lovely riverside setting in sight of the famous railway swing bridge, we mounted our machines to return to the Ferry and the return ride back to base, but Debbie’s Fizzy wouldn’t rev which we found was because the throttle cable had come away from the slide. As it was perfectly OK when we arrived at the pub we could only think that someone had been reliving their youth and had been “revving” the twist-grip while it was parked up. Everyone gathered at the Ice Cream Parlour for the last stop of the day and eventually Carl was allowed back on his route, he led everyone back through Beccles town centre and on to the rest of the country lane route back to Horham. A good day, our longest run of the year, somewhat challenging but everyone enjoyed the run. 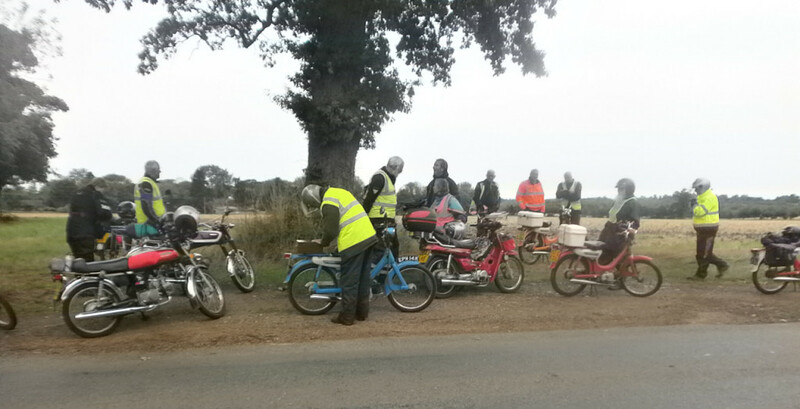 The Reedham Ramblers were: Debbie Doy – Yamaha FS1-E, Terry (mine’s a 99) Keable , Philip Chenery, Keith Flood & Carl Squirrell – Honda PC50s, Harold Wright – Honda Camino, Clive & Ann Fletcher – Lifan 100, Jim Davies – Mobylette, Carl Olley, Keith Miles – Honda SS50s, Michael Barrell – Raleigh RM5, Tim Reeve – Honda Novio. David Whatling – Berini.